From the team behind the award-winning One For Ten comes a feature documentary to lift the lid on the human cost of the death penalty in the United States. America's most divisive issue - capital punishment - is running into some trouble. With drug supplies for lethal injections drying up and public support at an all-time low, the struggle to keep executing is taking its toll. Going behind the scenes of some of the biggest headlines in the history of America's death penalty, the film follows the lethal injection protocol crisis that resulted in a botched execution; the rehabilitation of a man who spent 15 years on death row for a crime he didn't commit, and the family of a murdered young woman split by the state's pursuit of the ultimate punishment. 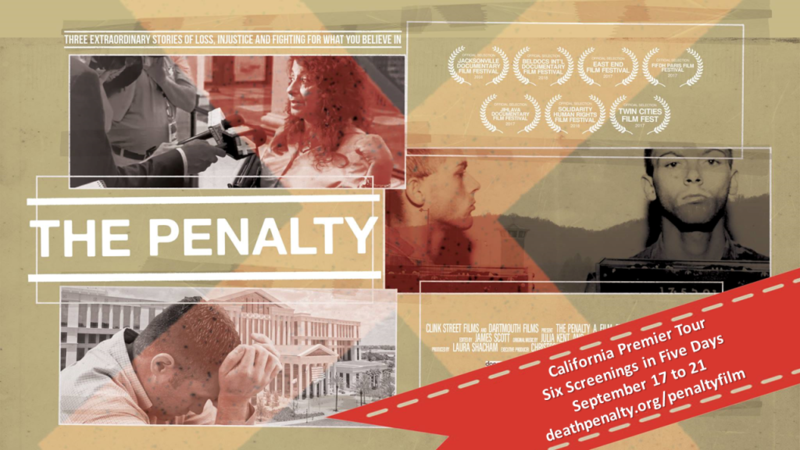 We are excited to announce the California Premier Tour of The Penalty, the acclaimed documentary from Reel Nice and Dartmouth Films, Directed by Will Francome and Mark Pizzey. The film will tour California from the Bay Area down to Los Angeles, Orange County, and San Diego, with six screenings in five days. At each stop, Co-Director Will Francome and Producer Laura Shacham will join local criminal justice reform advocates to discuss the ways in which the death penalty system brutalizes everyone it touches. Panel Discussion Featuring Co-director Will Francome, DPF Chair Billie Mizell, and Former Alameda County Deputy DA Darryl Stallworth. Panel Discussion Featuring Co-director Will Francome; Attorney and DPF Board Member Nanci Clarence; and Aundre Herron, Attorney, Comedian, and California Crime Victims for Alternatives to the Death Penalty member . Panel Discussion Featuring Co-director Will Francome and DPF President Mike Farrell — Additional Guests TBA. Refreshments at 6:00 PM. Screening begins at 6:30. Panel Discussion Featuring Producer Laura Shacham and Members of the Loyola Project for the Innocent. Panel Discussion Featuring Co-Director Will Francome; CSUF Criminal Justice Professor Stacy L. Mallicoat; and Bethany Webb, member of California Crime Victims for Alternatives to the Death Penalty. Panel Discussion Featuring Co-Director Will Francome and Celebrated Defense Attorney Alex Landon — Additional Guests TBA.